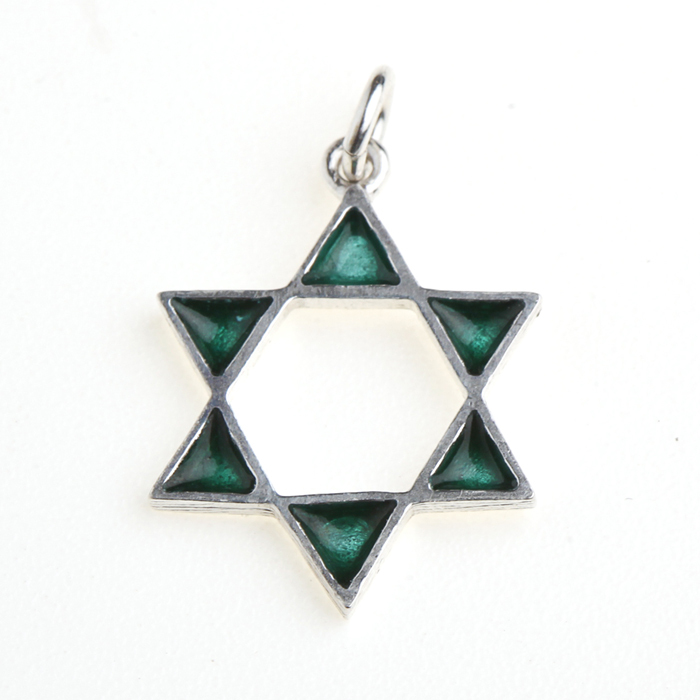 The six solid points of this sterling silver Magen David pendant are filled with green enamel. Combine the classic silver Star of David with a bit of color and wear this sterling silver and enamel Magen David pendant from Idit.+The classic symmetrical Star of David is outlined in polished sterling silver, and each of the six points is filled in your choice rich enamel. Green is widely regarded as a good luck color, being the color of new beginnings, and is widely regarded in Oriental cultures as an auspicious color that has the power to repel misfortune. While the deep blue is used in Kabbala tradition to symbolize good luck.+The clean lines and rich color of this silver and enamel pendant necklace make it a piece that can be worn by all ages. This Star of David makes a wonderful bat mitzvah or bar mitzvah gift - Jewish jewelry is always a popular choice for special occasions and this silver necklace will surely appeal to lovers of contemporary Jewish jewelry.+Idit Jewelry produces jewelry of the finest materials and best craftsmanship. All Idit pieces are handmade in Israel by Jewish artisans.+Wear this yourself or give it to a loved one - anyone who knows designer Judaica jewelry and fine silver jewelry pieces will appreciate it!+The Star of David pendant measures 1/2 inch X 1/2 inch (1.3 cmX 1.3 cm). The pendant comes with either a 16 inch or an 18' chain.+Select either green or blue enamel filling.